Visit MJA Coffee and Wine online at MJAcoffeeandwine.com for an eclectic mix of Hawaii coffee and Napa Valley wine set on 12 acres of lush, rolling vineyards in the heart of Napa Valley. MJA Vineyards is the home of Serene Cellars Cabernet Sauvignon, one of the top 100 Cabernets in Napa Valley. Tucked away in the back of the winery, you'll discover a small roastery where MJA Coffee and Wine roasts 100% pure Kona Coffee. MJA Coffee and Wine's Kona Coffee is roasted fresh daily and shipped out while it's still warm. Save on your next purchase from MJAcoffeeandwine.com with MJA Vineyard discounts, MJA Vineyard coupons and MJA Vineyard savings from 58coupons.com. 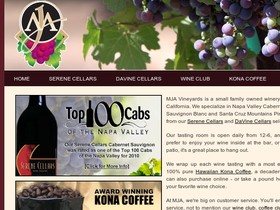 Purchase 2 bottles of Napa wine from MJAcoffeeandwine.com and get 1 free. Click link code to view. Enjoy flat shipping rates from MJA Vineyards of $5 per pound or $10 for ten pounds of kona coffee. Click link to shop. Save on Kona Coffee by buying 2 and getting 1 free, from MJA Vineyards. Click link to go there now! Purchase a case of the award winning Serene Cellars Cabernet Sauvignon 2005 and save 12%. Click link code to view details.